Discover the British Isles with Celebrity Reflection and relax as you cruise between iconic cities around the British Isles. 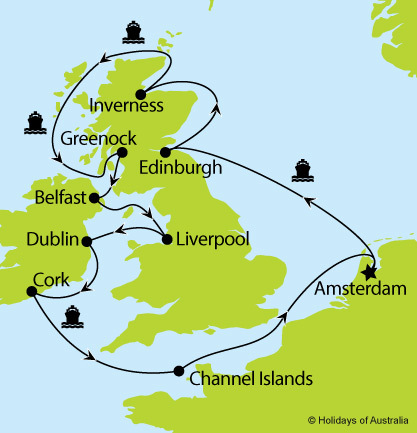 12 nights aboard Celebrity Reflection cruising from Amsterdam to Amsterdam with port calls in Edinburgh (Scotland), Inverness (Scotland), Greenock (Scotland), Belfast (Northern Island), Liverpool (England), Dublin (Ireland), Cork (Ireland) & the Channel Islands. Includes on board meals and entertainment. Itinerary & pricing correct as of 15 August 18 and is subject to change or substitution. ∑ Subject to availability, limited spaces available, surcharges may apply. If you would like to receive updates on new holidays, specials and more via email, tick this box.